MARIBOR,Slovenia - Slovenian authorities have begun exhuming a mass grave in the Tezno forest, north-eastern Slovenia, where over 15 000 victims slain after World War 2 by the former communist regime are supposed to be buried. 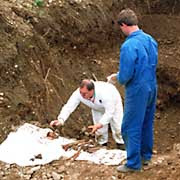 Slovenian officials estimate that a mass grave found near Maribor will most likely prove to be the largest in Europe, surpassing even that of the eastern Bosnian town of Srebrenica where the genocidal Serbian army mass murdered up to 10,000 unarmed Bosnian men and boys in July 1995,during the Serbian aggression against Bosnia. "It just might be that the greatest crime of the period following World War 2 will be uncovered in the mass grave in Tezno, one that even surpasses that of Srebrenica," Joze Dezman, head of the Commission on Concealed Mass Graves, told Slovenian state radio. Dezman referred to Tezno as "the murderous epicentre of Europe," according to the English-language newspaper The Slovenia Times. Slovenian officials believe the grave might include the remains of roughly 15,000 Croat members of the forces of the Croatian pro-Nazi Ustashas regime, who were trying to escape from Yugoslavia at the end of the World War 2. The mass grave was originally an anti-tank trench dug by Germans near the end of the World War 2. It is 1 kilometer long, 4 to 6 meters wide and the layer of human remains measures 1.5 to 2 meters deep, according to the Slovenian daily Delo. After holding elections in 1990, Slovenia declared independence and was spared the violence that tore the region apart in the following decade.. It is the only one of the six former Yugoslav republics to have joined the European Union and Nato. Slovenian president Danilo Tuerk didn't want to coment recently discovered mass grave - "I don't comment second class issues". That was his comment. In a country which wouldn't be a banana republic, he would be forced to resign after a statement like that. There are still mass murderers walking in Slovenia, they were rewarded with high pensions and other benefits for their crimes, the courts are dominated by judges appointed by communist regime, one of the judges of the constitutional court used to be a president of the former communist party. And this is a second class issue for our Sultan? One day, the guard told him he had heard something bad was going to happen the next day, and that he would let my grandfather and his friends escape that night. Only one other prisoner trusted the guard. That night he let my grandfather and the other man go through the fence. Nothing was ever heard from any of the other people in the camp again. I think that if my grandfather hadn't become friends with that Serbian, he would have ended up in one of the mass graves recently found in Slovenia.